Apricot chicken. It’s one of those meals that people like me who grew up in the eighties had regularly and it was a “busy mum meal” i.e. buy a whole heap of packets of things and whack it in the microwave. But I don’t work like that. And that’s why this slow cooker apricot chicken is different. If you’re used to the one your Mum used to cook, this won’t have the exact same flavour, but it’s healthier, has better ingredients and basically tastes amazing. 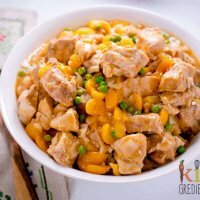 Now apricot chicken is apparently a winter food, but I don’t agree, somethings that you can make in the slow cooker are perfect at anytime of year and the fruitier, the better if you’re trying to slip this into summer eating habits. The benefit of using the slow cooker in summer- no oven heating up the entire house! 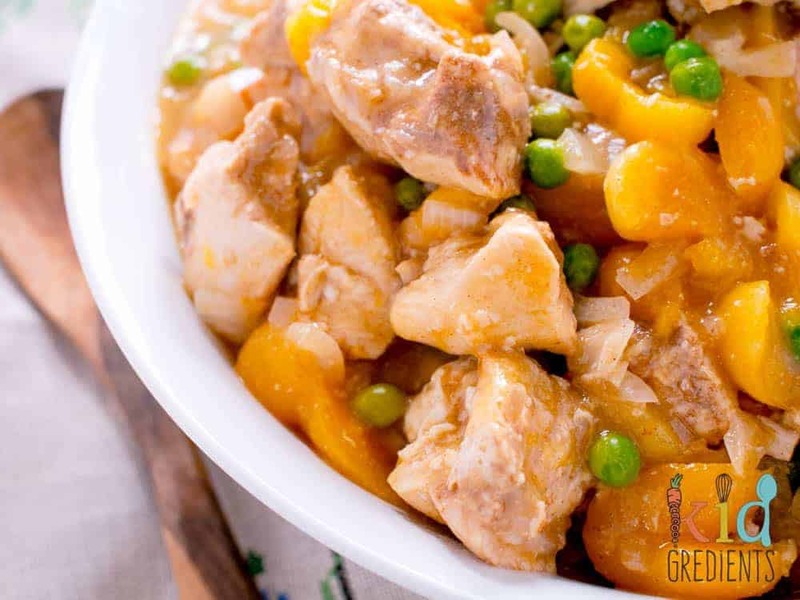 The flavours of this slow cooker apricot chicken are delicious and it is perfect for weeknights or week days when you are home, but want to get dinner over and done with earlier…at lunch time! Because it’s using chicken breast, this would dry out with longer cooking. If you wanted to put it on in the morning for dinner, just swap the chicken breast for the same weight of chicken thighs. Now I’m going to answer a question that many of you are thinking but too scared to ask…why would I bother with this version when the french onion soup version I make is just fine? 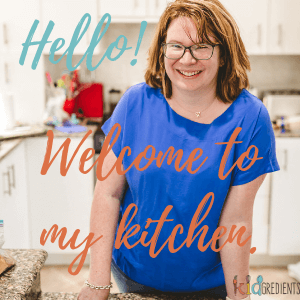 Well, this has wholefood ingredients and nothing nasty, so you can be assured that you are making the best effort to feed your family good food. Plus to be entirely honest, it doesn’t take that much longer! This slow cooker apricot chicken will give you one family meal for tonight and one to freeze, so in my books, that’s super efficient. And as an interesting aside, my grandmother hand stitched the napkin in the photos, with painstakingly small cross stitches that make my eyes water just looking at them. She was a needlework teacher and and was amazing at doing things like that! And as another aside: she doesn’t even eat chicken so basically I’m probably going to be condemned for putting it next to the bowl of slow cooker apricot chicken! 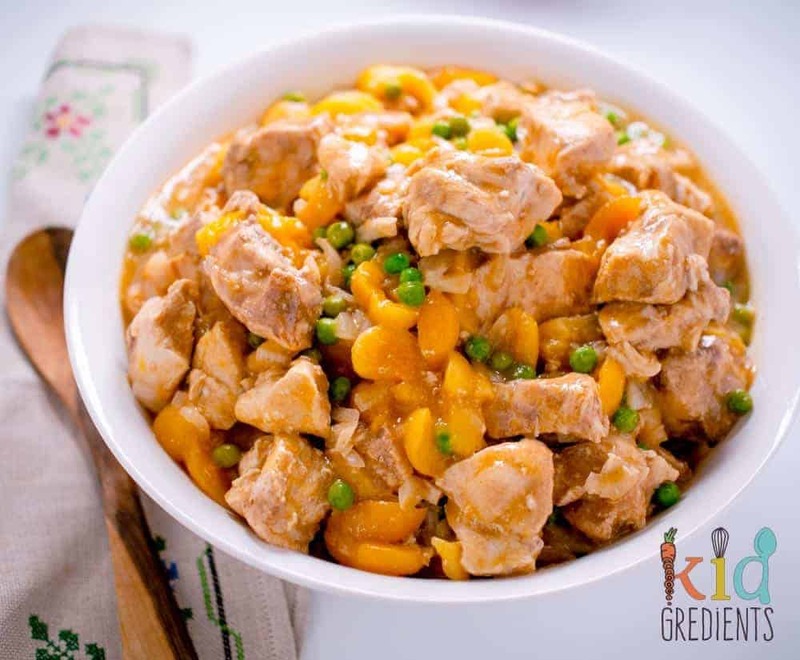 Not your mum's slow cooker apricot chicken, no packet mixes, no yucky stuff. 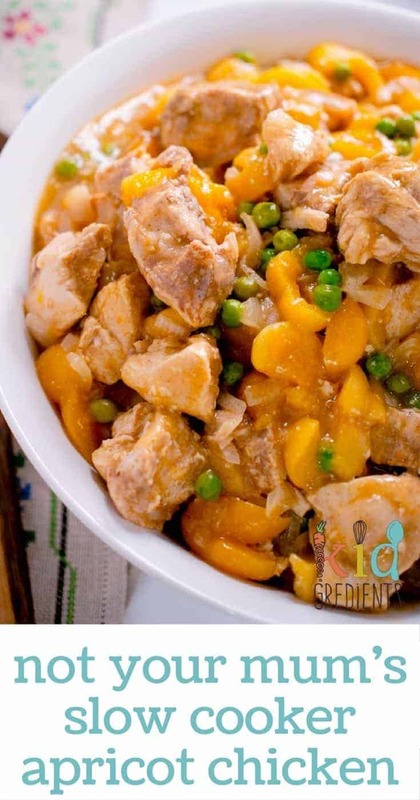 Just delicious slow cooker apricot chicken the whole family will love! Put the chicken breast into the slow cooker bowl with all the spices and the onion, massage the spices through the chicken to make sure it is well coated. Pour over the chicken in the slow cooker bowl. Put the lid on and cook for 4 hours on low. After 4 hours, remove the lid, add the frozen peas and keep the lid off to thicken the sauce for one more hour. Looking for other slow cooker ideas? Try some of these! So, you use the 425ml tin and fill it with water! I thought this was delicious! Really enjoyed it. Super easy. My 18 month old picked a few bits of apricot and spat out the chicken 😩 but that’s the norm for any food these days. Will still definitely make it again. Lol I remember when my kids were 18 months- the “foreign object stage” is what I called it! They spat out anything that wasn’t exactly what they wanted! I’ve tried your recipe today, but left out the honey. Even though I haven’t added any honey, the recipe seems a little too sweet…. not sure what I’ve done wrong. I’m hoping to resurrect the dish before dinner! Thanks in advance! Apricot chicken by definition is a sweet dish, I don’t now if you’ve had the “mum style” one, but this is similar in sweetness. If the sweetness is really too much, a dash of worcestershire might counter it for you, but rest assured, it’s meant to taste sweet! All sounded great. I’m a capable cook and this was easy to follow. It was like chicken floating in tasteless sauce with some peas. However my dog enjoyed the mass amount left. Thanks for your feedback. This is the first negative feedback for this recipe in over 8000 hits. I’m sorry it didn’t turn out for you. I’m SO excited, I think I have all (or most) of the ingredients I need to make this for our dinner tomorrow. Thanks Kylie. Love it. 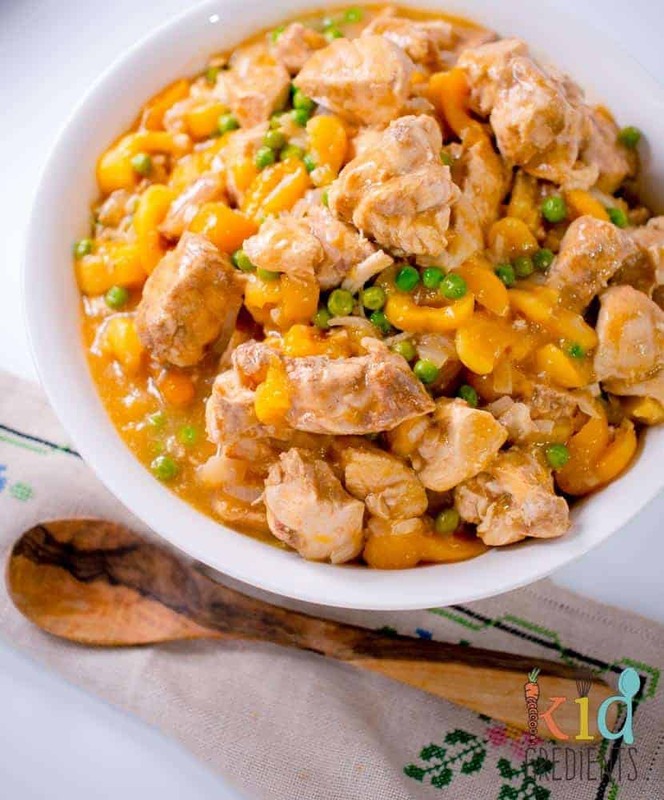 I always loved apricot chicken as a kid!! Thanks for the reminder – looks like a great recipe! What wet dog and nappies aren’t appealing house aromas? Since when? 😉 I love my slow cooker, even in summer! Oh I haven’t had apricot chicken in decades! Thanks for inspiring me to try it again! Yes please try it again! You’ll love this better-for-you version! This looks delish. I don’t even make the dodgy apricot chicken, so does that mean I’m really missing out. I really must try this! You should try it Penny, there is nothing difficult about it!